My mother was Marion McEwen. Her father was George McEwen... his father was James McEwen. James' father Peter married Mary McIntyre. They emigrated and were buried in Nairn Ontario. James McEwen was from Kenknock, Perthshire. We have his bible and some history of part of the clan. I too am interested in general clan history. There are many McEwen/MacEwan websites... different spelling, but they're all the same bunch. I find a lot of information on electricscotland.com. Here's a brief summary for posting general highlights and points of interest I've found with my Clan McEwen research. The McEwens are of Irish/Scotch ancestry descended from Irish Kiings who came to Scotland circa 500-600 AD. The McEwens of Loch Fyne established themselves in the district of Cowal about 1100-1200 AD. Their neighbours were the Lamonts and the MacLauchans. They were known as the McEwens of Otter. Eoghain na h-Oitrich (Ewen of Otter), who gives his name to the clan, lived at the beginning of the 13th century. His name is derived from Eoghan which translates from the Gaelic as "Born of the Yew Tree". In 1794, the Rev. 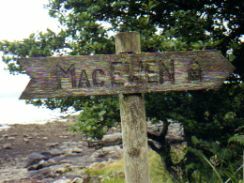 Alexander McFarlane wrote in his Statistical Account of the parish of Kilfinnan: "On a rocky point on the coast of Lochfyne about a mile below the church is to be seen the vestige of a building called Caesteal Mhic Eobhuin or MacEwen's castle ... this MacEwen was the chief of a clan, and proprieter of the northern division of the parish called Otter." The McEwens were displaced by the powerful Campbell clan who moved to Loch Fyne from Loch Awe in 1474 AD to be near the sea. The current Duke of Argyle is a Campbell. The last known clan chief of the McEwen was Ewen Earl of Otter who died or was killed without children; ergo no successor and the clan broke up no chief no clan. Some McEwens joined the Campbells... some eventually becoming hereditary bards and sennachies to the Campbell Chiefs of Glenorchy. And other MacEwens went to their cousins, the MacLauchans. Some ran off and became outlaws/rogues, a loutish bunch generally. The last witch to be executed in Scotland was a MacEwen. For info on the recent DIG of McEwen Castle go to the Glasgow Archeological Society and discover how our ancestors lived and worked and a hidden clue! For detailed McEwen family history go to CELTIC MONTHLY April 1912 to read McEwen and other small Clans. The COWAL GATHERING held near Loch Fyne in August is the largest Highland games in the world. Google ELECTRIC SCOTLAND/R.T.S. McEwen for lots more! Just had my first granddaughter so the Clan continues. Jim Allen son of Marion McEwen. It reveals the earliest known, as of now, accurate lineage. The reference to Skene is the guru who wrote the History of Scotland that I have not got to yet. Sween of Ottir, think "Otter Ferry Loch Fyne", was the last Clan chief. He left no male heirs, thus a headless clan (ours) was lost and was taken over by the Campbells who were related to Robert The Bruce King of Scotland. 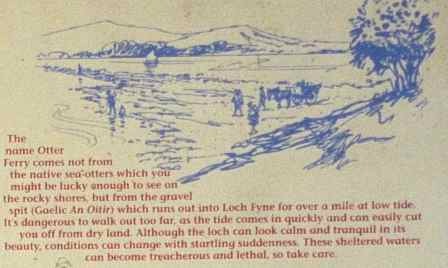 The training /practice for the invasion of Normandy June 6 65 years ago D-DAY was held on the shores of Loch Fyne likely near Otter Ferry the ancestral home of the McEwens. There is a long tradition of NAVAL service among the McEwens as can be found in research. The crest of the present McEwen baronet of Bardrochat in Ayrshire is the stump of a cut down oak ( yew ) tree. Our clan motto means REVIRESCO, We (I) grow (rise ) again. A song today performed by Rita McNEIL among others. This is an old family seal that can be traced to Swene MacEwen of Otter circa 1600 or earlier. There is some history to this in that with our cousins, the Lamonts from Castle DuNoon, battled the Campbells and their sister clans. I believe that it was a tradition to cut the tree down to retrieve the bodies. Legend has it that when the tree regrew, the new growth was red with blood. The British summarily tried and executed the ringleader. A grandson of John McEwen, same name, was born 1766, joined the Royal Navy, and was a commissioned captain sailing in the West Indies. Curiously enough his son Robert McEwen, also a naval person, died in 1860 at Monte Video the home of the recent correspondent. There is a new search engine... OneGreatFamily.com. It's like Ancestry.com. One freebee then pay as you go. December 14, 2009 - A castle like ours? Be careful what you ask for when you say keep sending research. I have looked at many castles and found one that best resembles ours. Go to Cowal Peninsula and you will see a picture of what I think matches with your photos. Also go to Otter ferry and you will see the actual quay. Since I have not been there yet pictures will have to do. Happy New Year to all McEwens. FYI - Mabel Jane McEwen passed away September 18 1988 100 years old near London, Ontario. She was the daughter of Peter and Catherine McEwen sister of another Peter, John, Frank, Hazel, and relatives in the Whetter family. We are all somehow related! 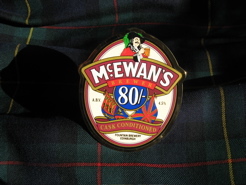 I haven't done much Clan McEwen research lately - working on my fathers line. Accidental research recently uncovered the following info which I find somewhat bemusing. I (like many others I expect) suspected that the name OTTER FERRY came from the sea otters who likely basked on the spit of land from which the ferry once crossed the Loch. From a general history of the NORSE/VIKINGS occupation of parts of Scotland over the years it is chronicled that a NORSE/VIKING CHIEFTAIN named OTTAR visited/raided the Loch Fyne area several times one could speculate that the McEwen lands were once known as the LAND OF OTTAR. Also given the Vikings reputation/behaviour it is possible we Clan McEwen folk have Viking blood. This would account for any personality disorders displayed by our clan. Here's what it says on the sign posed at Otter Ferry... That's the photo that we put up at the very top of the page. "The Name Otter Ferry comes not from the native sea-otters which you might be lucky enough to see on the rocky shores, but from the gravel spit. (Gaelic = An Oitir) which runs out into Loch Fyne for over a miles at low tide. It's dangerous to walk out too far, as the tide comes in quickly and can easily cut you off from dry land. Although the loch can look calm and tranquil in it's beauty, conditions can change with startling suddenness. These sheltered waters can become treacherous and lethal so take care." We moved this from Jim's original Clan McEwen Research story. We thought you'd enjoy his continuing research. Click on that link and you can make comments of your own. We don't get your address from comments, if you'd like to contact Jim... include your address and we'll pass it along. As we've said before, we've seen MacEwan and McEwen -- also McEuen, McKeown, Ewing and the list goes on and on. Near as we can tell, the clan name comes from the Gaelic MacEoghainn for goodness sake... no wonder clerks and scribes had trouble figuring out how to write it. Our spelling is one of the "different" ones; yours may be too, but we're sure we're all related, so we hope you enjoy Jim's Clan McEwen research. Feel free to send us your own stories or research; just go to our Clan MacEwan/MacEwen Stories page. We love to read them all!